Reports of sexual assaults by children on other children are rising, according to police figures seen by BBC Panorama. But those reported cases are only the “tip of the iceberg”, according to one police child abuse expert. 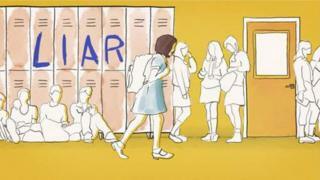 Emily – not her real name – was 15 when she was sexually assaulted by a boy in her class, unnoticed by her teacher, who was at the front of the room. But after reporting the ordeal to the police, she says she was bullied by her classmates. The number of reported sexual offences by under-18s against other under-18s in England and Wales rose by 71% from 4,603 from 2013-14 to 7,866 from 2016-17, according to figures from a Freedom of Information request. A total of 38 out of the 43 forces in England and Wales responded. The number of reported rapes among under-18s rose 46% from 1,521 to 2,223 over the same period, according to 32 police forces that supplied a breakdown of figures. Reports of sexual offences on schools premises also increased from 386 in 2013-14 to 922 in 2016-17, according to 31 police forces – including 225 rapes on school grounds over the four years. James and Anna’s daughter, Bella, was six when they discovered she had been sexually assaulted in the playground for six weeks by two boys. “She burst into tears, she just dissolved in front of me,” Anna says. Anna and James went straight to the police, but were told that as the boys were under the age of criminal responsibility they could not be charged. The family say they had to fight to get the police to make a record of the incident. They are now taking legal action against the local authority, as they say the school failed in its duty of care. “We have all of these unheard victims… and they’re unheard because there’s no register, because there’s no crime,” Anna says. Since March 2013 a total of 1,852 children under the age of 10 were reported to police for sexual offences. The youngest was a four-year-old accused of attacking another boy, aged five, in Northumbria. Teachers have a duty to report an alleged assault by an adult, according to the Department for Education, but there is no such obligation if a child is accused – schools are advised to follow their own child protection procedures. “School leaders and schools want to get it right, but they’re not always getting the help and support they need,” Sarah Hannafin, policy adviser for the National Association of Headteachers, told Panorama. Image caption Pupils reporting abuse say they don’t feel supported. Of the sexual offences perpetrated by under-18s, 74% resulted in no further action, according to responses from 36 out of 43 police forces in England and Wales. Mr Bailey said such cases are very difficult to prosecute. “You’re dealing with people who’ll be reluctant; you’re dealing with cases whereby there’s been a relationship in the past. The Department for Education said: “Sexual assault is a crime and any allegation should be reported to the police. You can see more on this story on Panorama on BBC One on Monday at 20:30 BST.